Apple has released an updated version of their Apple Store app that allows for in-store pickup of items ordered online as well as the ability to perform a self-checkout when buying accessories at a retail storefront. Personal Pickup allows you to shop the Apple Store directly from the new app, pay for your item using your iTunes account and pick it up at a near-by retail store. Users can fully customize purchases such as upgrading the processor or adding more memory to an iMac. Most in-stock orders are available for pickup within an hour in the US. EasyPay allows customers to scan a barcode using the iPhone camera and complete your transaction right in the app using your iTunes billing information. It’s unclear how one would verify payment with an Apple Store employee since there wouldn’t be a physical receipt. We assume you’d just show your digital receipt to someone stationed at the door. Other new features include the ability to track pending orders as they are being shipped to you. There’s also a section that allows you to see your order history for your records. As of writing, Personal Pickup and EasyPay are only available in the US. 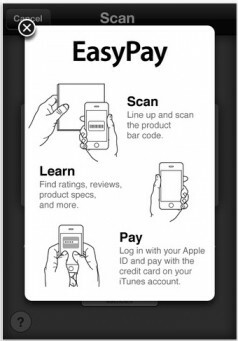 EasyPay requires an iPhone 4 or 4S. Package tracking is available in Canada and China and all features require iOS 4.2 or higher. Apple will likely open these features up to other markets if they test successful in the US.